The bat may not exceed 34” in length, and the bat barrel may not exceed 2 5/8” in diameter. All aluminum/alloy barrel bats and all composite handle (only) aluminum/alloy barrels are allowed. Only composite barrel bats certified and marked BBCOR .50 will be allowed. Wood barrel bats conforming to the specifications of Official Baseball Rule 1.10 are allowed. The bat may not exceed 34” in length and the bat barrel many not exceed 2 5/8” in diameter or be greater than a -3 length to weight ratio. Only metal/composite bats certified and marked BBCOR .50 are allowed. Wood barrel bats conforming to the specifications of Official Baseball Rule 1.10 are allowed. 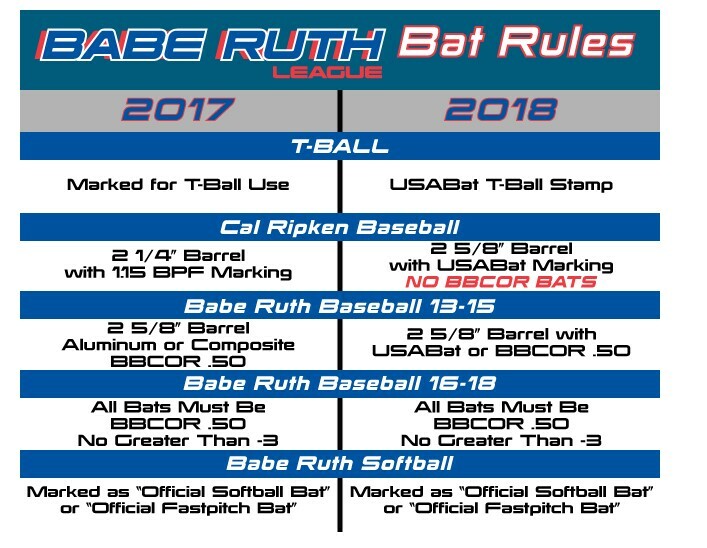 ALL DIVISIONS - If any bat in Cal Ripken Baseball or Babe Ruth Baseball cannot be clearly identified for its make and model to determine the barrel composition, then the bat must be removed from the game. Any cracked or flat bats must be removed from the game.